Who really succeeds at meal planning? Do you ever really want to stick with what you planned? I never did and I found I wasted just as much food prior to meal planning. Luckily, there’s Taco Tuesday! Yay! Every Tuesday, I know what we’re eating; tacos, burritos, or quesadillas (since my kiddies aren’t taco fans…. crazy, right?). Why not extend that to every day? Well, that excellent idea was so simple and brilliant that of course, it was not mine. I found it in a book, Simplicity Parenting. So, every day we have a different theme for each meal and it’s made our lives easier. Ours are Pasta Mondays, Taco Tuesdays, Dutch-oven Wednesdays, Rice or Soup Thursdays, Fish Friday, Grill Saturday and Open Sunday. At first, it seemed limiting and I felt pressure to have a different meal of each theme. Soon, I found in an effort to continue these themed meals (only because my children were now excited for their planned meal and ate dinner better) I made certain staples over and over. One example is of Pasta Monday, how many variations can I do that is easy and nutritious that my children will eat????!!! Well, I found many… but they happily accepted the same broccoli, mushroom, tomato linguini with garlic cream sauce over and over and over again. My daughter is so happy over being able to predict the day’s theme. Sometimes she even picks a different noodle and is so happy. We even throw in chicken, sausage, or pork some nights. Though I don’t consider myself a picky eater, I have some things that really bother me. One of which is gummy mashed potatoes. You make them, they are smooth and creamy and wonderful…. then a few minutes on the table they turn to glue. Sticky, un-spreadable glue. Why?! My dinner was perfect until these gummy potatoes that are now sticking to my serving spoon. Well, I’ll tell you why… and it’s science-y! My favorite. The reason why mashed potatoes turn gummy is because they get over mashed. Typically from a beater, mixer, or food processor. Please, for the sake of your dinner, do not use these tools any more. Plus, they’re difficult to clean. Potatoes, like all vegetables (I know they’re classified as a “starch” but it’s produce), have cell walls. When cooked and then beaten, these cell walls break and release the starch contained inside. Starch will act as a glue when mixed with liquid. My mom would use flour and water to seal her egg rolls and she literally called it “glue”. So, the starch makes the whole bunch stick together. That’s just not all that pleasing. How to avoid this? For starters, be careful not to overcook your potatoes. Cut them in to smaller pieces so that cook more evenly and cook quicker. I cut mine into about 1 inch cubes. Boil (or steam!) until they break with a fork, but not crumble. I’ve seen instructions of boil for this long at this heat and so forth but really, it’s hard to be precise especially if there are variations in the size, stovetop differences, amount of potatoes. Make sure they’re done and then drain the water (if boiled). Like nearly everyone else who’s alive, I check out pinterest and very sadly I have seen awful no knead bread recipes. I have struggled with bread baking for years. From TBF (total bread failure) to PBF (partial bread failure), I’ve seen it all and struggled with consistency using similar recipes and instructions. I have about 5 bread books and after tutorials and whatever other resource I could find, I have finally been able to consistently bake bread that rivals albertsons or publix fresh baked bread. You southerners know what I’m talking about. Here are some problems with the bread recipes I see. They do not allow proper proving before baking. One cannot get a strong gluten structure with one rise. Nope, I’ve tried it. And if you wiggle the bread too much, it all deflates! Also… a 30 minute rise is horribly insufficient. Here may be some common troubles with your bake. If you’ve had these problems, I know I have! Then you’ve listened to those blogs from people who listened to blogs or got an insufficient book and looked no further. I have a couple and I have followed these blogs. These sweet dears probably do not know that it’s possible to make the awesome bread in the stores. I thought, maybe there are additives or preservatives for those results, like in box cake… no… the instructions were out there and I wish I had found them sooner. So! I will share my recipe and instructions and then explain “the why”. Mix flour, yeast, and salt together in your largest bowl. Pour in your water and mix. I like to use my hands or a butter knife. Yeah, may sound crazy but it works and cleans off easily. You want to mix to make sure the flour is all incorporated or you’ll end up with “flour pearls” and that makes for ugly (and homemade looking) bread. Once you’ve got a nice sticky heap, cover and set aside for at least 2 hours! Dust the top of the risen dough, a clean work surface and your hands with flour. Your dough should still be quite sticky and droopy. Shape your dough into a rough rectangle. Lightly dust with flour (called a gluten coat… I don’t know why), and fold into thirds. Take your dough and fold that in half and drop into an oiled bowl (or sometimes I dump it back into my previous bowl with dough residue… just slightly more work to get it out if you do it this way). Your dough will rise much quicker this time. Maybe a 1/2 hr rise. Take it out (do not punch it) and shape into a ball. Allow the air bubbles to pop out (this will prevent giant holes in your bread). You want to achieve a taught surface without the dough tearing. This surface provides tension for your yeast to rise against and further develop the gluten. Heat your oven to 475 and place your dutch oven to heat up. 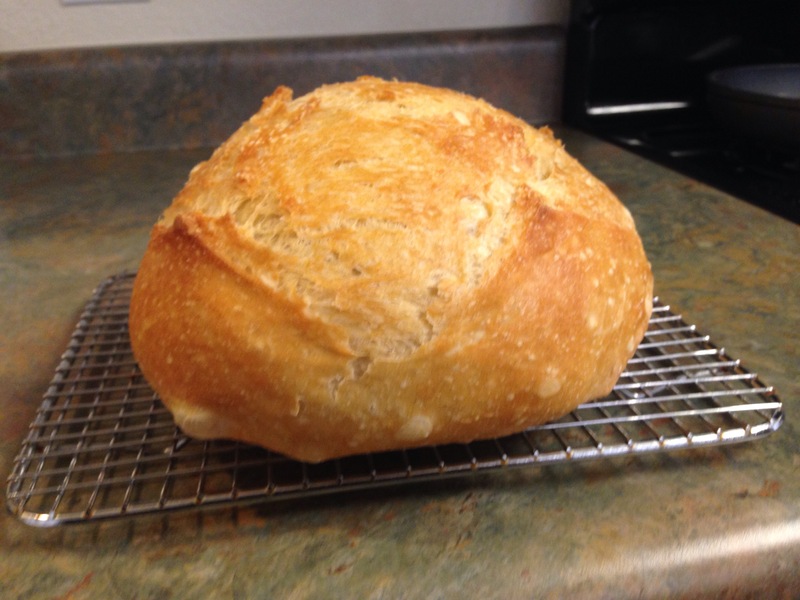 (If you don’t have a dutch oven, that’s okay… but I’ve found it makes the best bread. Place a pan with water in the oven next to the bread) Prep your parchment paper for either the dutch oven or your baking sheet. 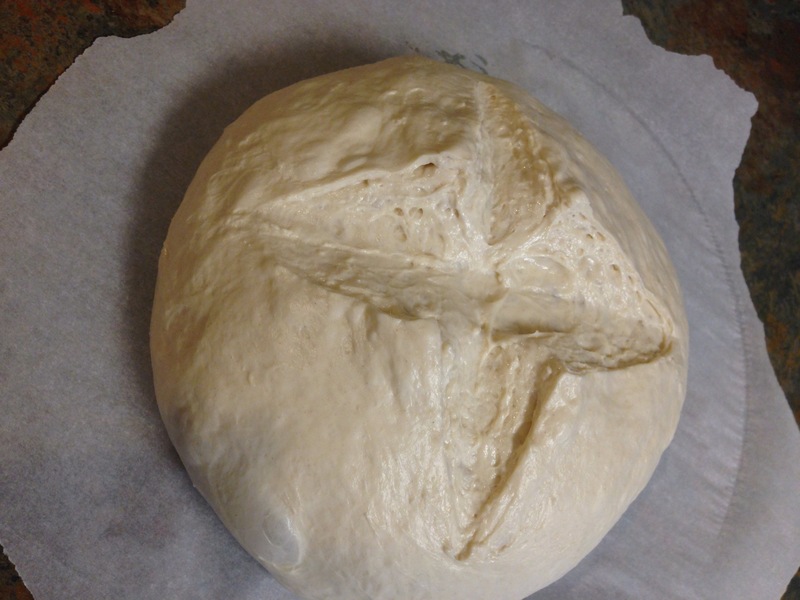 Shape your dough again into a ball and set on your parchment paper. Place your bowl it came out of on top of the dough so that it does dry out during this proof. I let it rise anywhere from 20-30 minutes (better than an overproof). Take a knife and slice at least a half inch into your dough, deeper if you dare! Remove your dutch oven from the oven and drop your dough into it! Place the lid and set your timer for 45 minutes! Now, the reasons I do these things. Many recipes call for yeast to be added to water to bubble… other than find that your yeast is alive, it doesn’t serve much purpose. This is different than what is called “creating a sponge” which is a developed base for your bread. That’s like a bread soup or bready paste to be added to flour later for more complicated breads, very different. The problem that could develop is the warm water… what exactly is warm water? I’ve known people (and done this myself) who have microwaved the water to get to a higher temperature and accidentally zapped those poor yeast and hence… no rise. Now improper yeast storage is also a problem! My poor yeast didn’t rise because they were all dead! Store your yeast jar in the fridge. Also, adding sugar changes the taste of the bread which could be nice in some instances but for regular ole bread, it isn’t needed. Well… my yeast was refrigerated and I did this recipe, but my bread still didn’t rise! Okay… did ya use distilled water? hmm? The reason to use distilled water is that the chlorine (in all tap water) kills the yeast! Chlorine kills everything, that’s why it’s a great disinfectant. Purified water isn’t good enough, most come from the tap of wherever it’s bottled. Sad truth. I have found that in a pinch, a thrice filtered water isn’t so bad. Not as great as distilled but kills less yeast than tap. I’ve also used distilled water that is enriched with minerals (because I couldn’t find distilled) and it’s about the same as a thrice filtered tap water. For best rise, go with distilled. The reason for shaping and reshaping the dough is to develop the gluten. Gluten is the protein in wheat flour that come together in a matrix that leads to a chewy texture, think pizza crust vs cake. 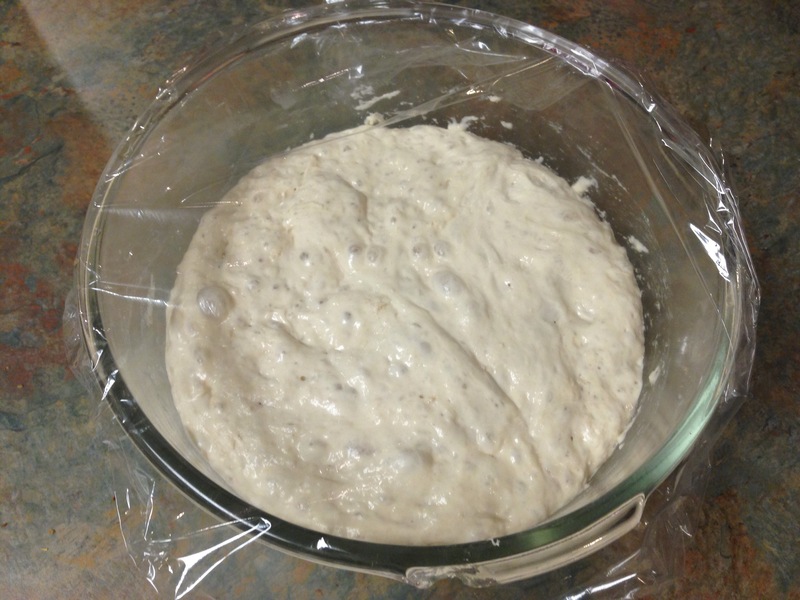 In the no knead method, the yeast bubbling away is enough agitation to develop the gluten into a matrix. But one rise is not enough. You may have heard of the “window pane” test to see if your bread is ready (you can stretch your dough until it’s thin and lets light through or almost see out of it). You will not get a window pane with a one rise dough. This is why your bread will deflate because the gluten is not developed enough to provide structure to hold it’s shape. This is why you shape and reshape. Having the tension is essential to develop the bread. Slicing the dough, besides giving a pretty design to your bread, gives the dough room to rise so you have less broken edges. Some is nice but you have a more finished looking product with slices. Or cuts! 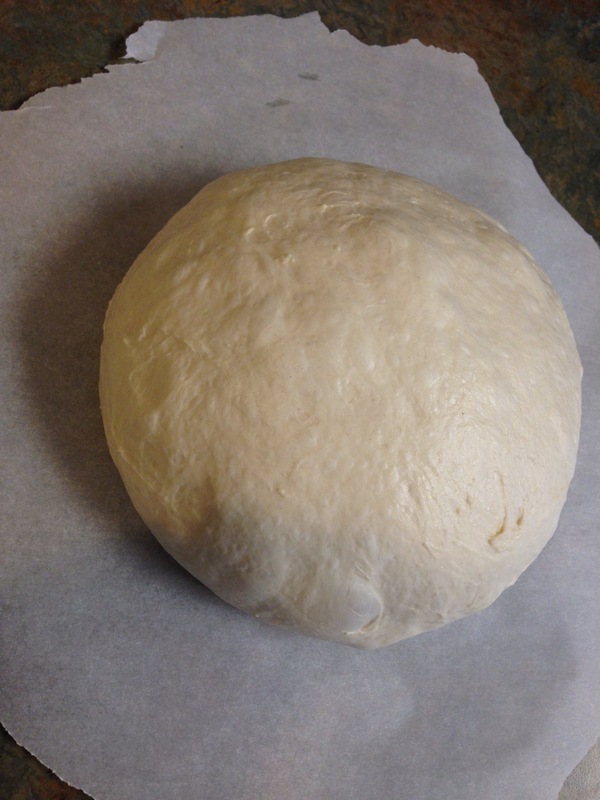 Many one rise recipes do not include a slice because with the gluten not being developed, the bread will immediately deflate once cut. It also isn’t as able to be as fluffy on the inside! While talking of texture, it’s very important to let your bread cool because if you tear into it too early, the moisture will evaporate out of the bread! That is how you end up with a gummy texture. The bread needs time for the moist hot air to redistribute back through the bread, this also helps give a softer crust too. Prior to learning these additional steps, I always had incredibly thick and tough crust. I love a good crust but this was bordering on tooth breaking. So, I hope that your bread turns out wonderful and you enjoy the sweet music of crackling crust from fresh baked bread. Happy baking! Get professional looking cookies at home! Hello! Have you ever wondered why you follow these professional recipes down to the very last letter and end up with an amateur result? I did… as a naturally competitive person that I am (perhaps to a fault) , I was constantly irritated that my baked goods, cookies in particular, were not better than the store bought brand. “Ah, that is because the stores have their own bakers”… well, what are those people if not normal folks who get a job at that bakery? But more importantly… are their homemade cookies better than mine? Not anymore! I have compiled a list of common mistakes that I have made and other things to makes the most awesome cookies and impress any crowd. 1. Soften butter properly. This seems easily and self-explanatory but it’s not. After years and years of flat, weird-textured cookies I came across proper softening. Butter is “softened” at about 65 degrees… this is ideal because beating raises the temperature of the butter. Butter is “melting” at about 80 degrees. So if your butter is 75 degrees prior to beating, by the time you’ve beaten it, then your butter is no longer softened but melting. a. Cut your butter into tablespoon pieces. I cut them and spread them apart from each other for even softening. Otherwise, you end up with a stiff middle and melted ends. b. Leave your butter to soften for about 45 minutes. Unless you live in an igloo like my sister, then leave it out for about 2 hours. Never overnight! That is technically melted butter and your cookies will not be as good. Do not listen to the advice of tv cooks… they are wrong in this instance. c. Never ever heat or microwave your butter. I figured this would go without saying, but I’ve had more than a few conversations on this. 2. Use an oven thermometer. This will ensure that your oven is the proper temperature for cookie baking. Also, check your oven for even temperature. I once had an oven that was way hotter on one side. If you have an oven like that, half way through baking, rotate your cookie sheet. 3. Invest in a cookie scoop! This is my favorite. A cookie scoop is great because it provides a consistent size for all your cookies. They will bake the same but most importantly… the cookies will be pretty and look professional! Also, make sure when using a cookie scoop, scoop against the edge of the bowl. If you scoop uneven scoops, then what was the point, yeah? 4. Always use parchment paper. Oh, parchment paper, how do I love thee… I won’t count the ways. Parchment paper is so great; it keeps your cookie sheet clean, keeps the cookies from sticking to the cookie sheet, and protects the cookie bottoms from burning. 5. Follow the instructions. If your cookies call to be refrigerated, refrigerate the dough… I’ve found that 2 hours is barely sufficient. Overnight chilling yields much better results. 6. Use a timer. I am guilty of forgetting to set my timer periodically. Make sure to not keep opening the oven door to check them if you forget to set your timer, lets out the heat and could mess up cookies. 7. Be observant. Now, this is for a couple things. See how your oven is, if your cookies call for 10 minute baking but are to crisp, then reduce your timer. If it calls for 10 minutes but it’s underdone, leave it in longer. Yes, this kind of contradicts number 5, but it’s because ovens are not all cast from the same mold. 8. Most important… If at first you don’t succeed. try, try again! I am most guilty of running away after a baking failure. For this reason, I avoided cookies for many, many years. All the more reason I felt this is tip list was so important. I hope that whatever I’ve learned can help you make awesome, pretty cookies at home. You’ll have your guests asking “where did you buy these?” Ah, music to my ears. If you have any other tips that I don’t know about, please share. Let’s make the world a better tasting place. Happy baking!